We had our first real snow on Sunday and woke up to quite a bit on the ground on Monday morning. Winter had officially arrived. While that snow is almost all gone now, we know that more is on its way in the next few days. And much, much more is on its way in the next weeks and months. But this year, we are prepared. The snow tires are on the car. Getting up our hill won't be exactly easy, but it will be significantly easier than it is without the snow tires. The windows are covered with plastic. When I first moved here, I thought that was ridiculous, but I have learned just how important it is to keep out the cold air, especially in our 90 year old and very drafty home. Who knew that a little bit of plastic vinyl (so much better than the shrink wrap stuff) would do so well to keep the cold out and the heat in? The garage is cleaned out. The snowblower is gassed up and ready for use, and we can fit the car into the garage. The snow gear is ready. The girls have worn this season's snow boots, snow pants and winter coats to school this week. I've already washed Sophia's twice, but if they want to play in the snow we won't be scrambling to the attic to figure out where all the hats and gloves are. The non-skid stuff is on the front stairs. 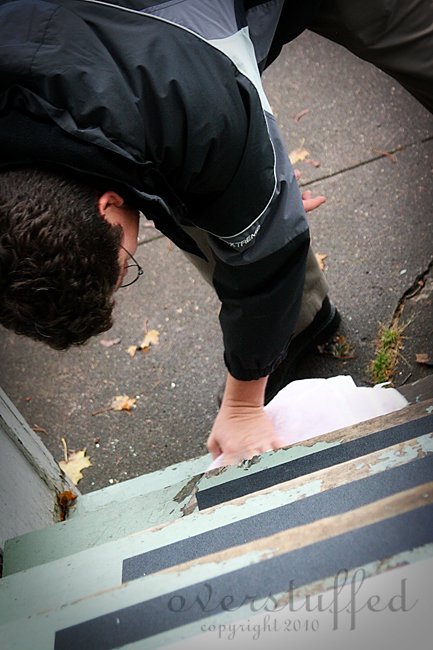 Our front porch has a set of steep stairs that can get slick in the winter. Joel bought the stuff this morning (which will wear off by spring, but has to be put on now because it won't stick if it's too cold or wet), and was out there with towels and a blow dryer to get it down. It was the one thing we had forgotten before the snows came. As we have been making our preparations this fall, I couldn't help but think about how the seasons of the year have such a spiritual aspect to them. Summer is easy, carefree and winter can be difficult when you aren't ready. The fall and the spring are the in-betweens, but they provide an excellent time to prepare. And life is the same. We have easy times, hard times and all the times in between. Are you prepared for the hard winters of life? Have you guarded against the cold air? Can you make it up the hill? Will you slip on the ice? Can you play in the snow, and find all the joys winter has to offer despite its hardship? It's sometimes hard to remember when all is going well, but once it's hard, it's often too late. I appreciate the seasons, because we do know that winter is coming eventually and we know we have to be ready for it when it arrives. And while I don't know when a trial is going to come into my life, I do know that I am not exempt. I will need to winterize while I can. Another post, another chance to win the $100.00 gift card from BlogHer. This one includes a video starring me and Chloe the pilgrim girl. Go ahead and make fun of me, but don't forget to enter to win! Just leave a comment, that's all! Great analogy and I loved reading about your preparations. We're still having great fall weather here, but snow is a matter of days rather than weeks away, I think. . . I have a few winterizing things to do myself. . . I also love the analogy. It is so true, in ever aspect of our lives. With the economy what it is right now, it would do us all good to evalute the necessities of life. I haven't yet got out the snow boots, but the air is cold enough for snow, so I think we will be doing that this week. Wow-that is a lot of work to do for a season change! I love living in Utah and getting all four seasons---but I'm glad winter isn't quite the task here as it is there. I think there definitely is a spiritual aspect to the changing of the seasons and I like the way you describe it here. I have never tried putting plastic on the windows. Coming from California, we're still pretty new to Winter prep. But I just might try it! I love the seasons as well. It is one thing I missed when we lived in CA. I bet it feels good to be ready for winter. Just like it feels good to spiritually do things everyday to be ready for things that come our way. Stay warm and safe. I LOVE your blog. I hear you on winterizing—even though we don't often get snow here, winter seems to have arrived in the blink of an eye. The wind kicked up, the rain came down in sheets, and the power went out. And I'm still dressed like it's September—I need to take a page out of your book and prepare! Those are beautiful parallels, Lara. I just wish we had more of a "spring" here in Utah. There's alot of snowing going on here in the Spring. Sounds like you're all ready! I still need to plant my tulips. I hope its not too late. I should probably be doing that instead of blogging.